Home : Fashion & Style : International Polka Dot Day - join in! 1) Wear something with polka dots. It can be anything – shoes, accessories or maybe nail art? Yes, we’re getting SoNailicious to help us with that part. 2) Take a photo of your polka dots. 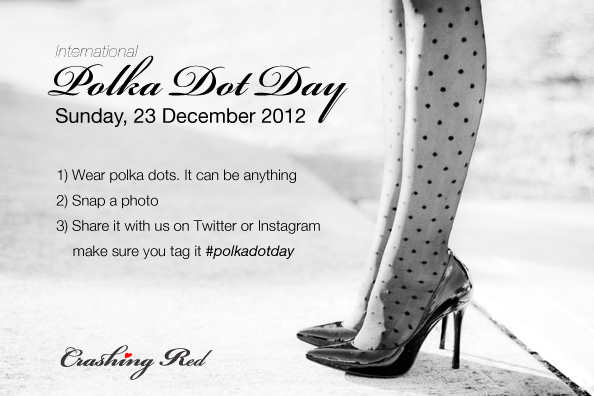 3) Share it with us via Instagram or Twitter by hashtagging it #polkadotday. You can also share it on CrashingRed’s Facebook (if you wish) or on your FB, just make sure you tag me @CrashingRed in it – so we can see your photos! If you need more polka dot inspiration check out our official mood board and feel free to follow. Who knows, maybe you’re the rising star of the polka dot movement? If you want to know the story behind the Polka Dot day check this post out. So… are you EXCITED lovelies? Are you joining in? This sounds like a great idea! It will motivate me to find something with polka dots as well. I’m not sure how valid it is to say this, but it sounds like you own Polka Dot Day (based on some tweets I’ve seen too). I am okay with this. See you there! yep, that’s right! I even had to patent it :) Can’t wait to see your outfit darling!!! Sounds like fun as I love polka dots! I’ll take part too!